Whether you’re a cord-cutter or someone who uses a standard cable subscription, sometimes all you want to see is the Olympics highlight reel. TiVo’ing four hours of Prime Time coverage to just wade through the muck is not my idea of a good time. 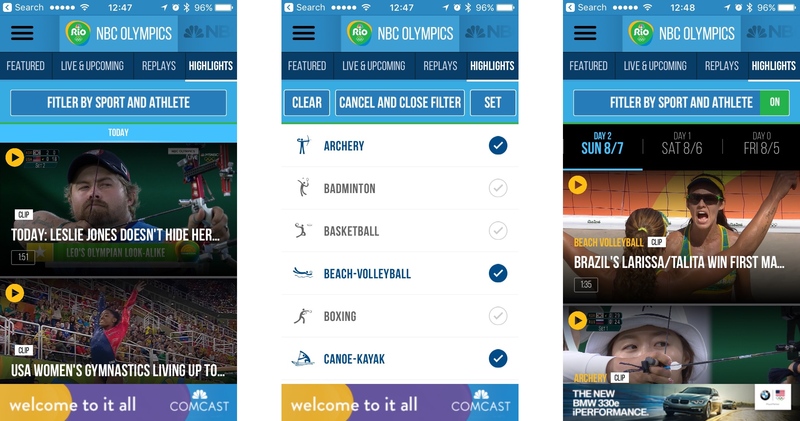 Enter the NBC Sports app. Launch this on your Apple TV, iPhone or iPad and you can instantly see short clips of just the highlights from the Rio 2016 Olympics. Sure, down the road you may find you want to watch entire matches, too, but this is a great way to catch up quick while whetting your appetite for future events. I tried this yesterday on my ATV3. So parsed down as to be not enjoyable in any way. Can’t stand how NBC does the Olympics for the last decade so I simply no longer watch. Coverage couldn’t be more LAME and frustrating. …. the coverage on my ATV3 is abysmal and that is being overly generous. Last time I really enjoyed olympic coverage was when we lived near enough Canada to get the Canadian coverage. Entire events start to finish. Barely any athlete vignettes with tear jerker story and sad music. Less of the “miss the entire event” except … here is the US competitor and now here is the top finishers. Synopsis of events is less than engaging. And with Canadian coverage we got to see lots of events that never get any coverage in the US. Very fun. Too bad NBC has CONTROL in the US.